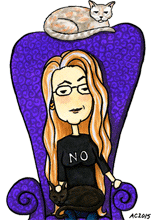 This piece went through several incarnations before I got it to something I was happy with. 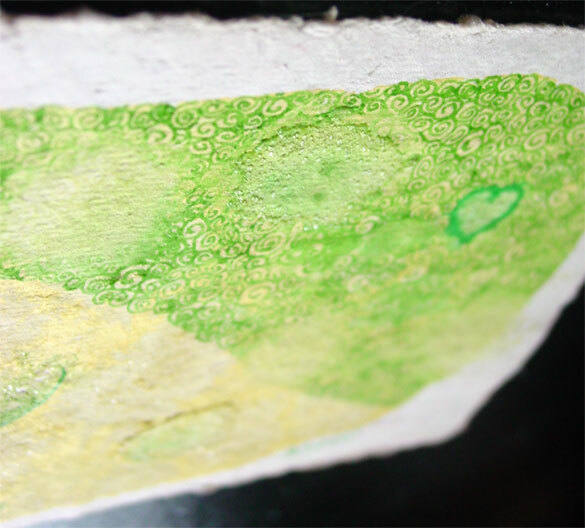 The final product has a cheerfulness to it that goes well with the lemony yellow, enhanced by multiple layers of salt, watercolor, and pen and ink in two shades of green. The salt pool at the upper left formed a heart all by itself, so I couldn’t resist giving it an outline in the same grass-green ink as the spirals below, which tended to run and pool wherever there was enough salt left on the paper. The bright new-leaf green of the spiral-textured section is done with a Pilot fountain pen from Japan, and the ink surprised me by being nearly obliterated when I dropped water onto it, unlike the black pen from that same line, which tended to blur but stay strong in Salt Cell 2. 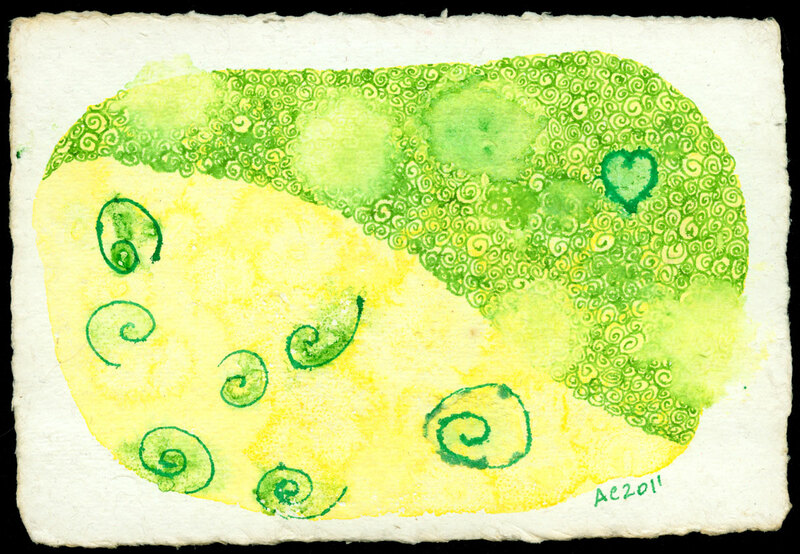 Lemon Heart, 6″x4″ watercolor, salt and pen and ink on handmade watercolor postcard, $99 with free shipping. You can see below how the salt made sparkly craters in some places on the surface of the piece, though this photo was taken before I was completely finished, and some of the texture has since been obliterated or changed.